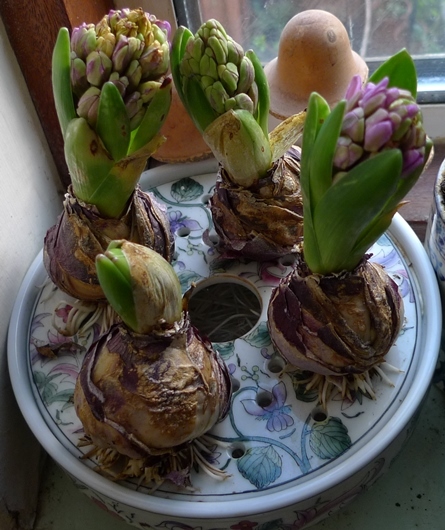 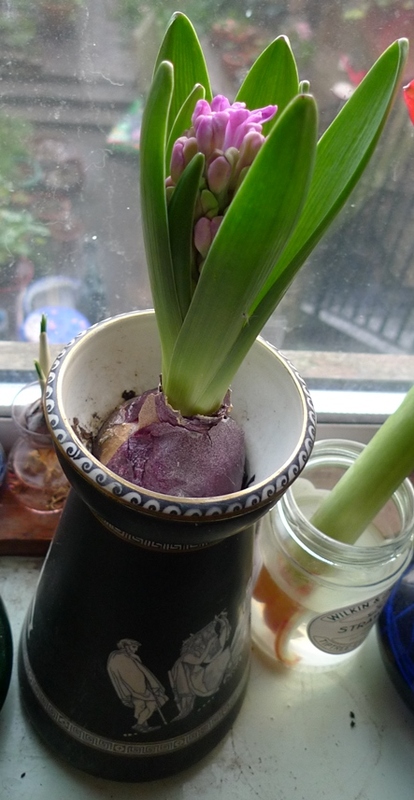 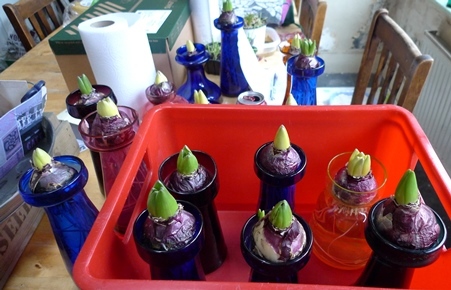 I was hoping some of the bulbs in the remaing bowls would catch up a little with the larger ones but no luck so far so I thought they really need to come upstairs even if only 1 bulb in each is going to bloom. 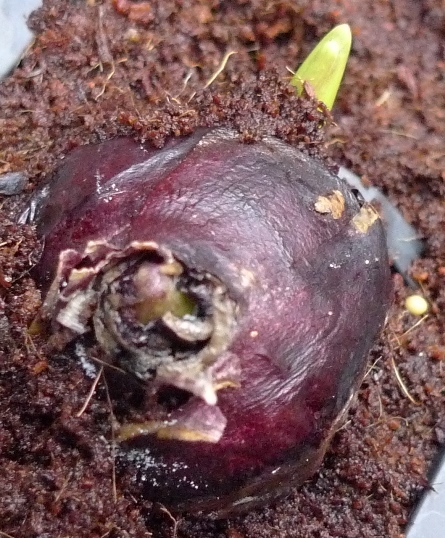 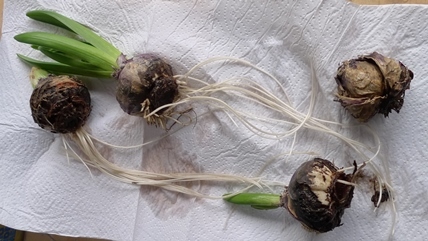 Some of the crocus bulbs have very developed roots some have no roots at all. 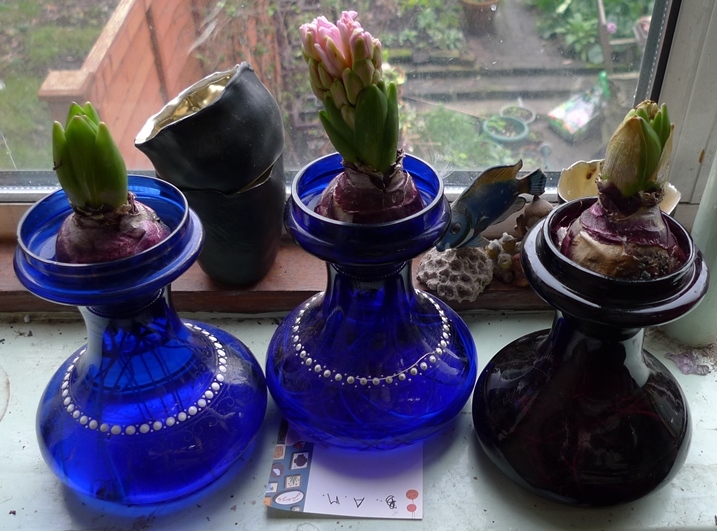 Bowl 4 on the left with Miss Saigon from 2 different suppliers, bowl 2 in the middle with 2 Splendid Cornelia and Miss Saigon and/or Delft Blue (that one got a bit confused), crocus bowl on the right. 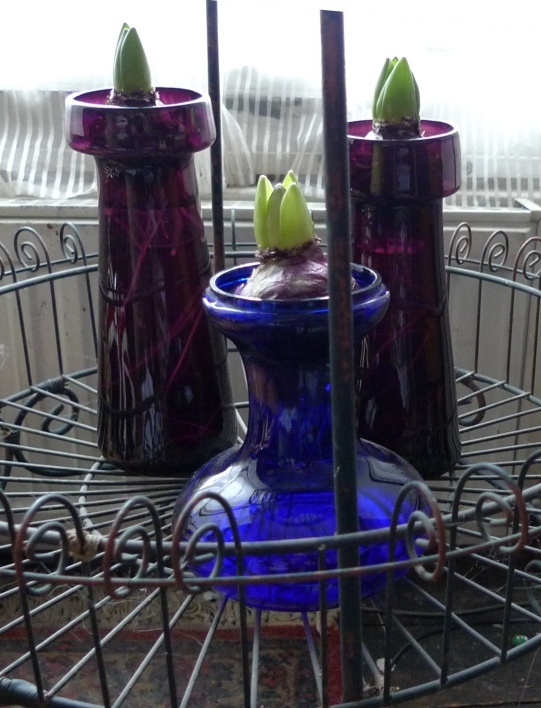 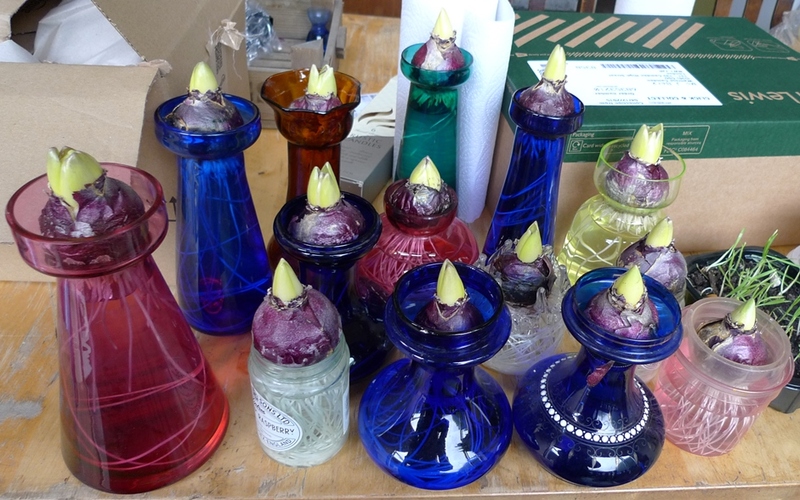 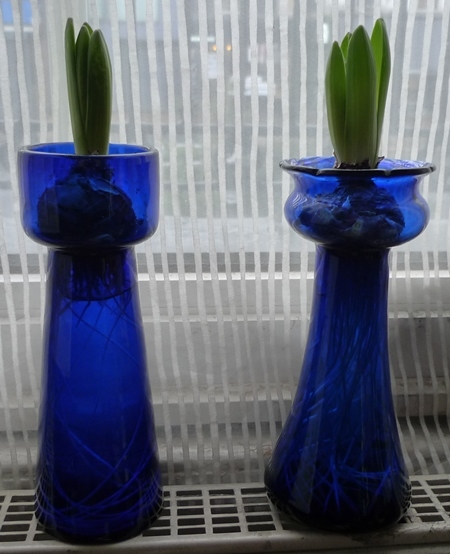 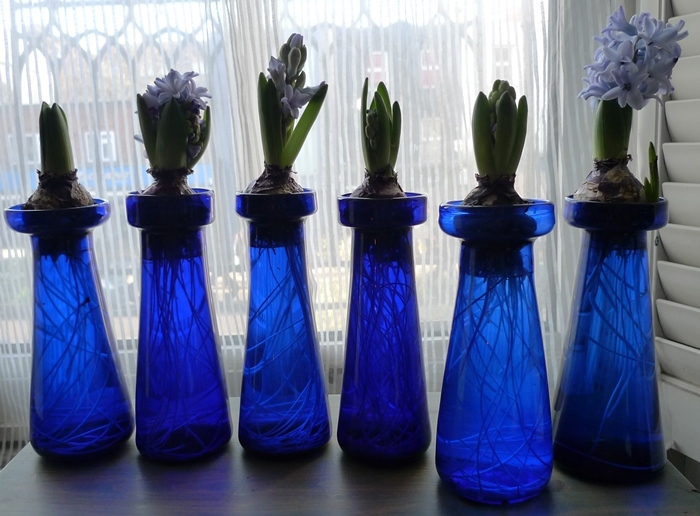 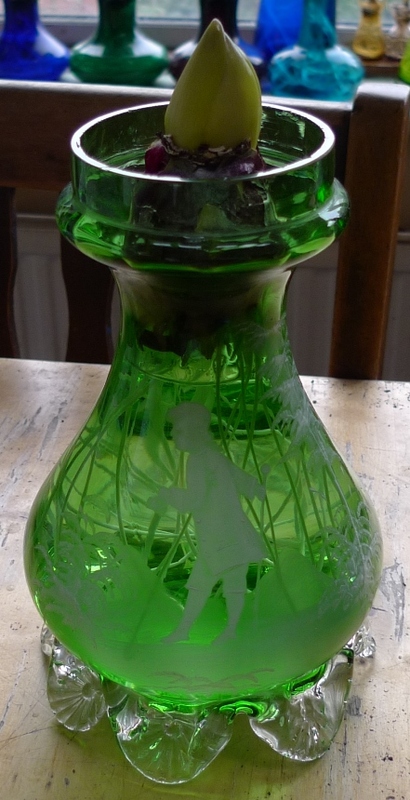 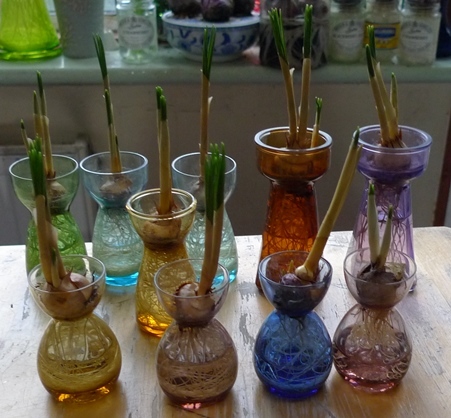 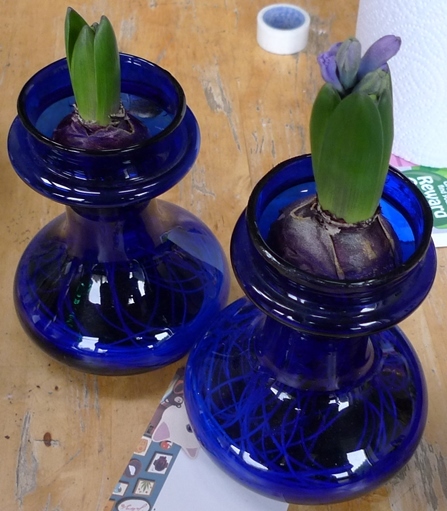 I just realized I hadn't uploaded this pic of the crocus vases which I took a week ago. 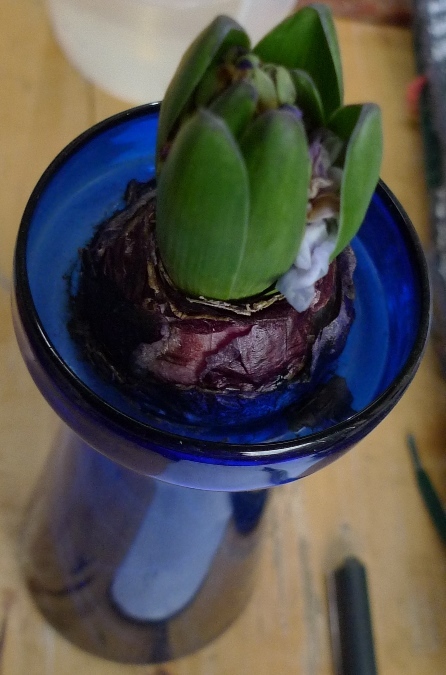 Still no flowers but lots of roots. 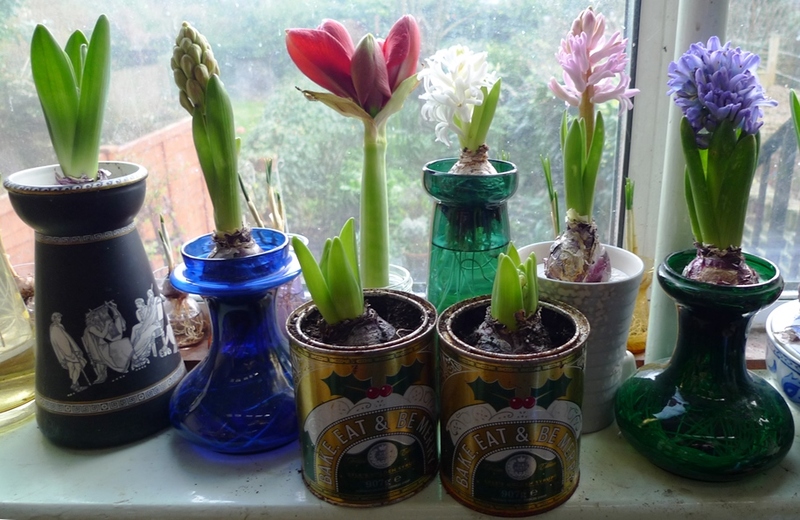 The Christmas-themed golden syrup tins are disappointingly out of season now. 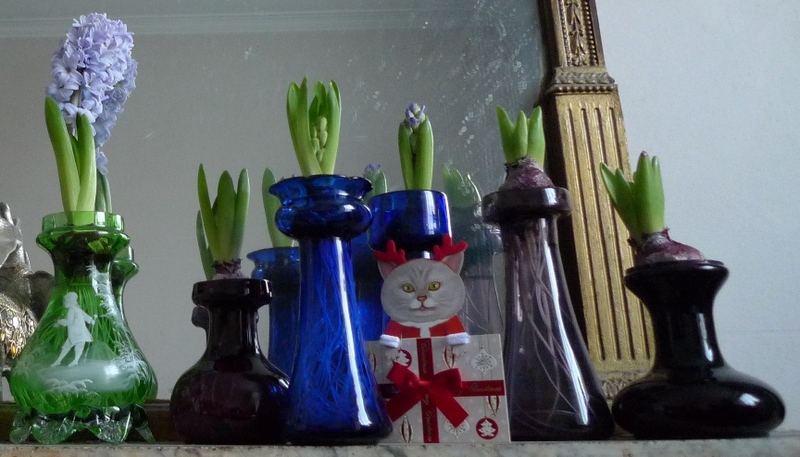 They were only ready to come up from the cellar this past week. 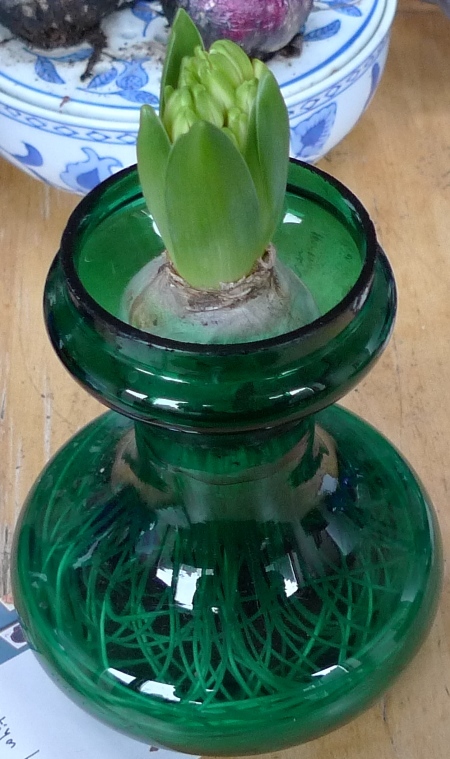 The usual problems with amaryllis bulbs, not just falling over and breaking (therefore that short-stemmed flower in a vase) but one of the vases having a crack and leaking the water out and staining the table. 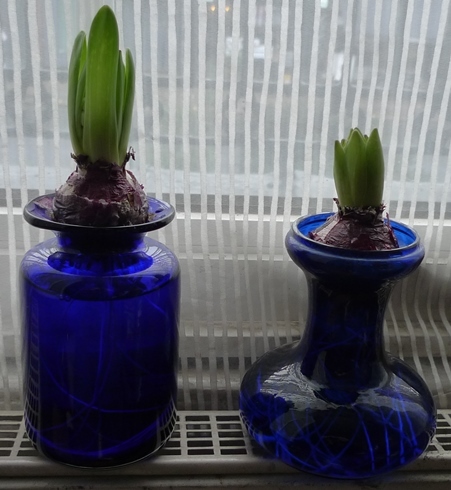 Maybe the crack happened when they fell over? 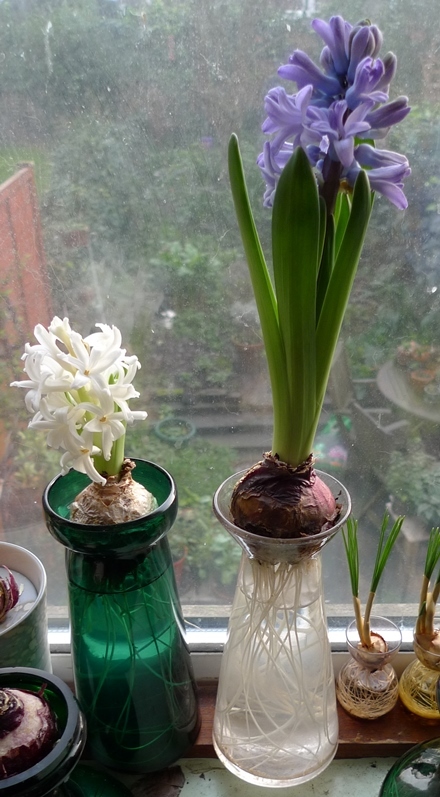 I'm pleased with the White Pearl hyacinths, even though they are a bit short, on the left is an unprepared Peter Nyssen Miss Saigon. 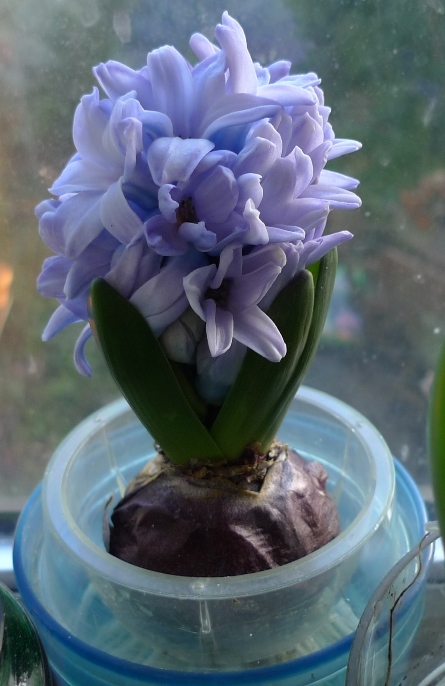 Yesterday, I've discovered a few problems today (3-1-2016). 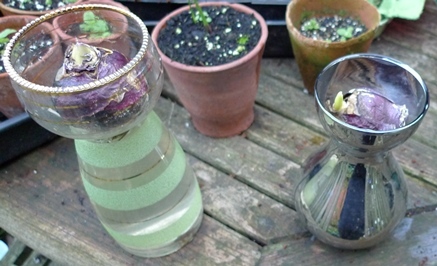 The green vase (back left) has a shrunken bulb that has sunk into the water and is rotting. The rest of the Fairy White hyacinths are looking good. 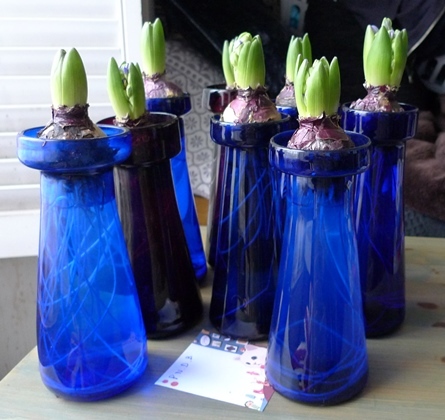 None of the mail order bulbs is large enough to fit in some of these very wide mouth vases without possibly sinking in - bulbs do seem to shrink a bit as they grow. 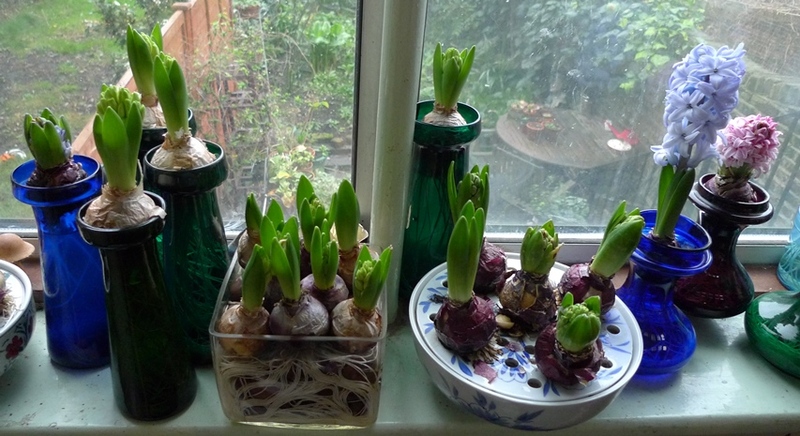 Back to the bins of bulbs from the garden centre! 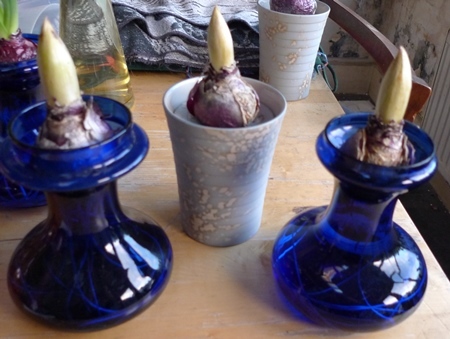 at least for the few vases needing large bulbs which I will now mark as such on my spreadsheet. 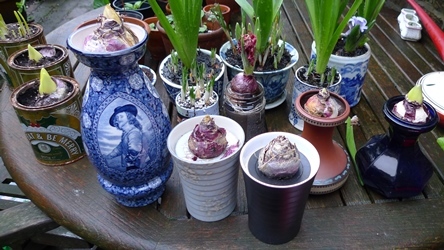 I bought these prepared White Pearl bulbs for some late vase purchases but bought too many so just had to put them in any pots to hand. 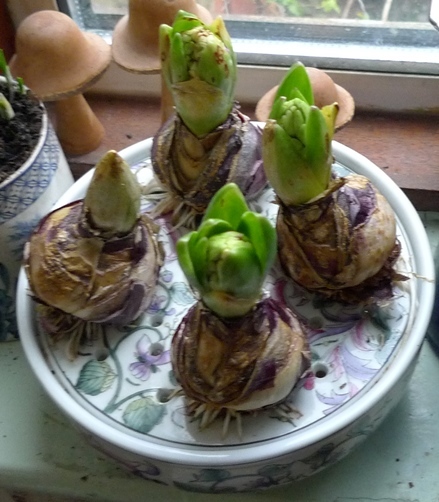 They all seemed to have bulblets which I will try to grow on. The Cirrus Hornsea bulb pot in the first pic above is also from the garden centre bins, although not sure which variety. 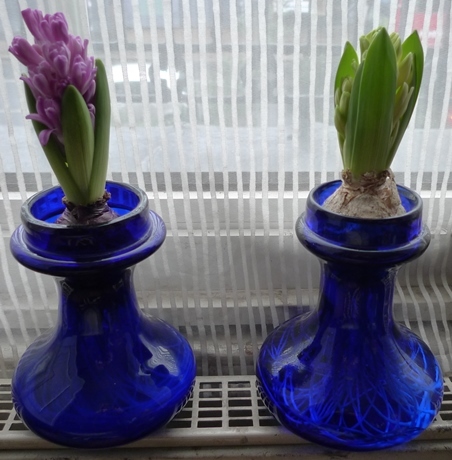 Some of the vases upstairs also have those larger bulbs as these were recently purchased vases: Skyline on the left and Jan Bos on the right. 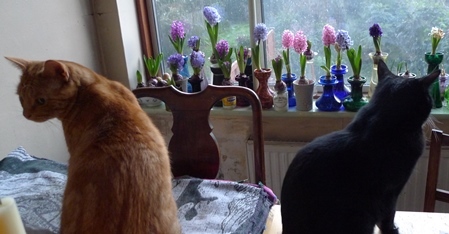 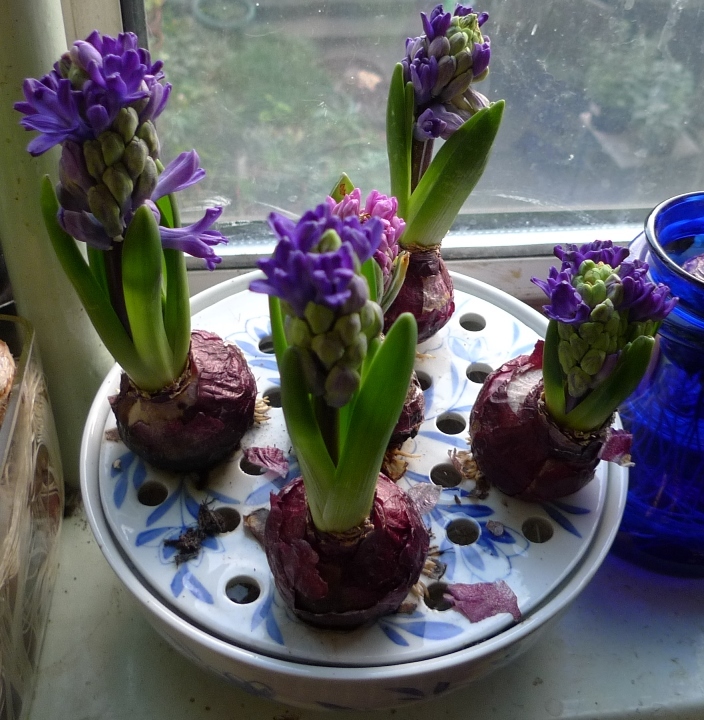 I'm not sure what variety these dark purple hyacinths are - certainly not one I ordered. 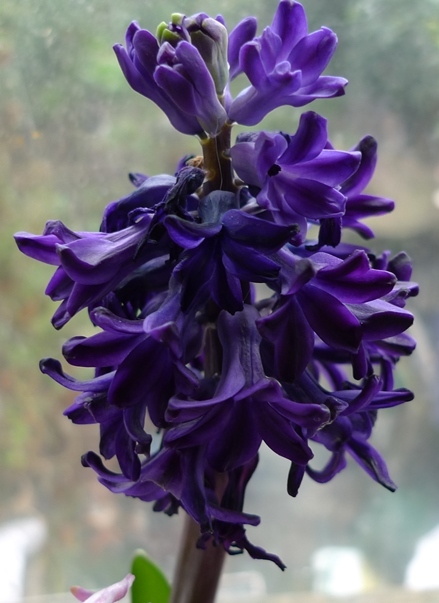 They were supposed to be Sky Jacket but obviously are not but they are quite attractive; I love purple flowers. 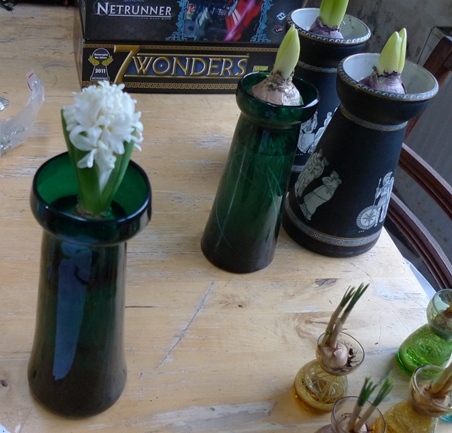 I tend to use white hyacinths in green vases, this year Fairy White, flowers a bit small but pleasant enough. I think the small ones in the square vase are the ones from Sainsburys. 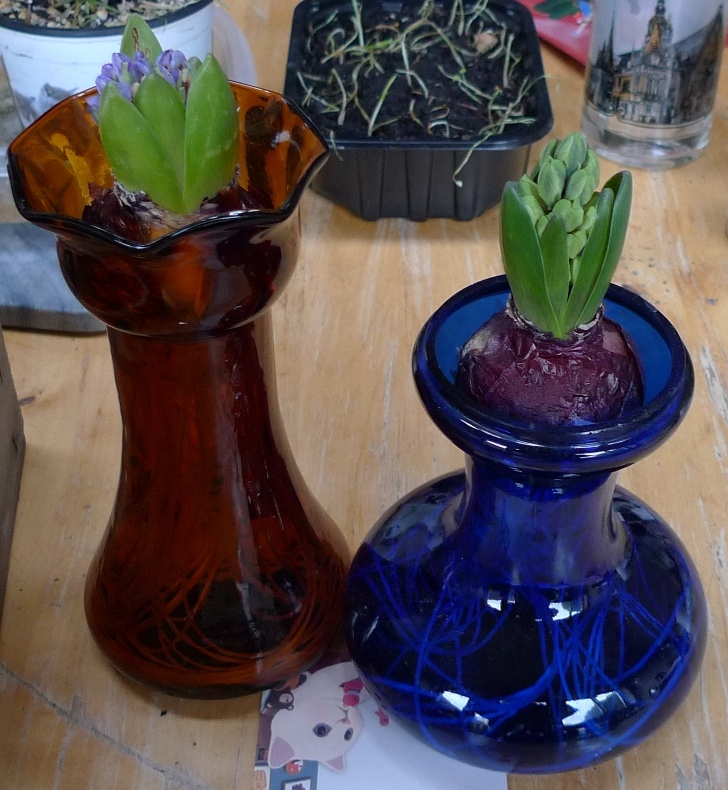 They are surprisingly good. 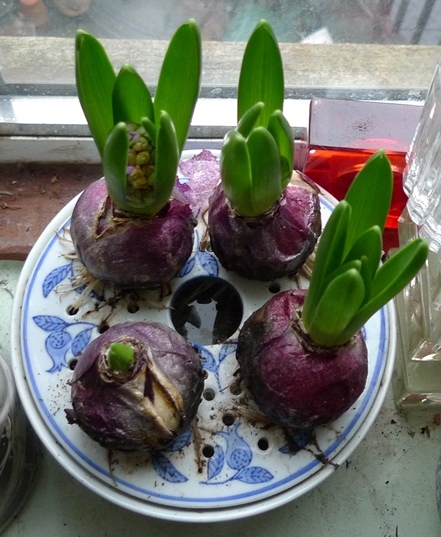 I had some rather small bulbs, from a multi-pack from Sainsburys which didn't even have varieties marked. 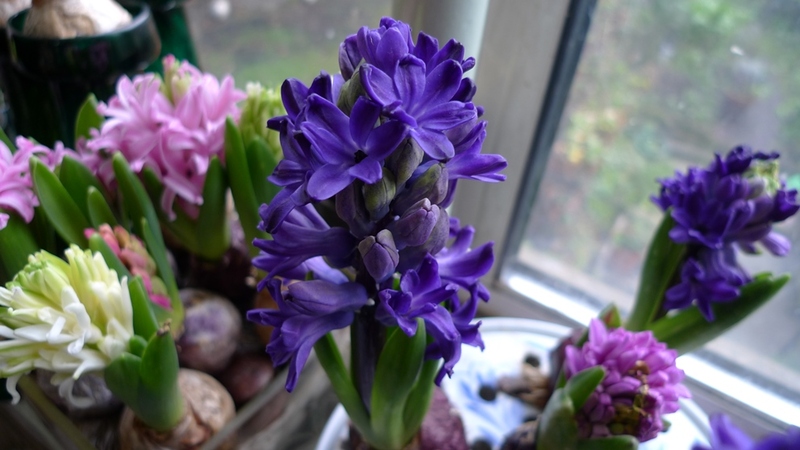 This flower is small but a nice colour and well-formed. 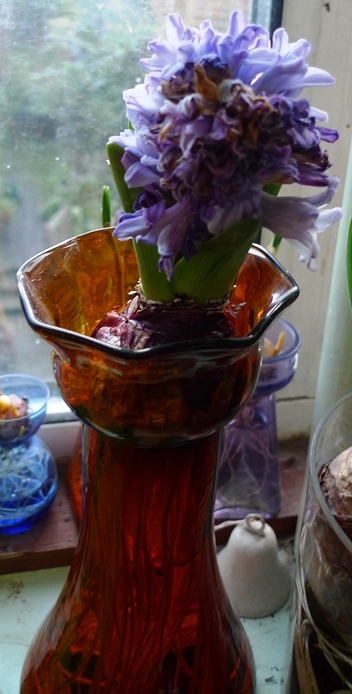 It's coping well with a small rose bowl filled with pebbles. 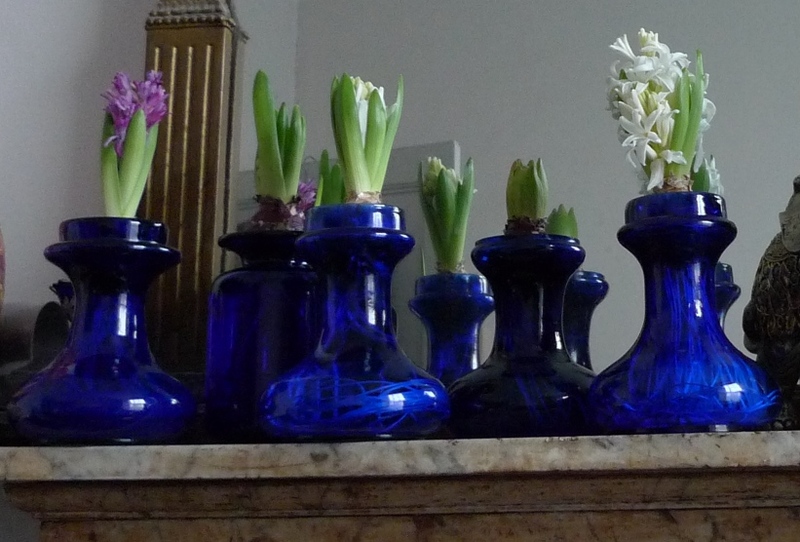 More of those bulbs in the square vase above. 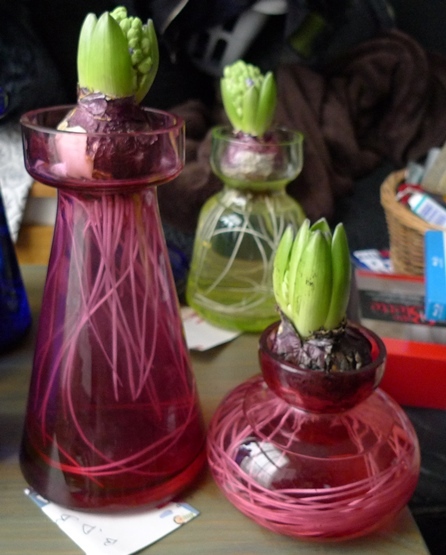 I'm not really sure why I pressed on with these. The bulbs look terrible and the buds not much better. 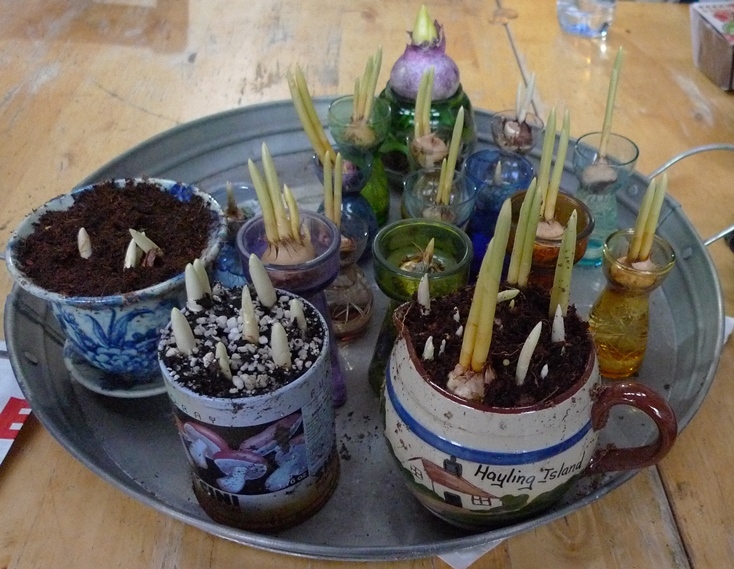 Unprepared Miss Saigon from deJager. 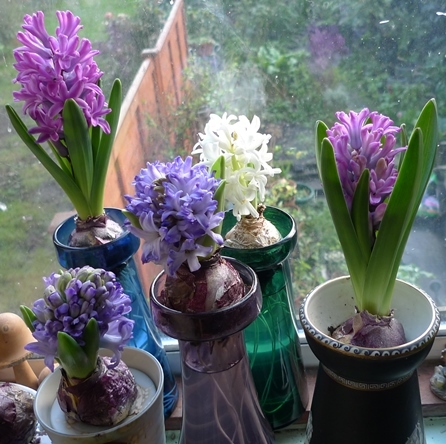 I think that pink hyacinth below is Splendid Cornelia but I'm not absolutely certain, could be Ann/Anne Marie/Mary or even Miss Saigon which I haven't grown before so not sure of its exact colour. 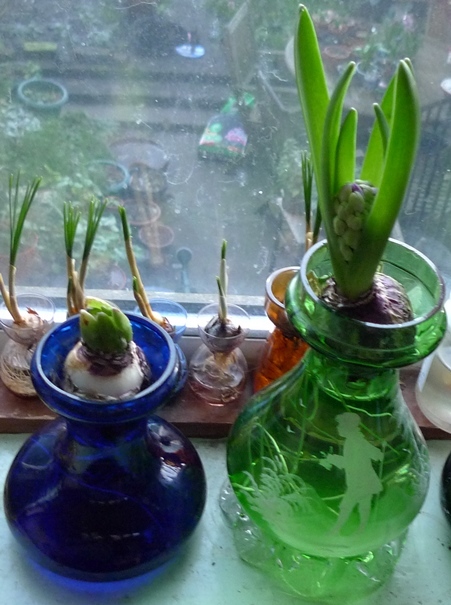 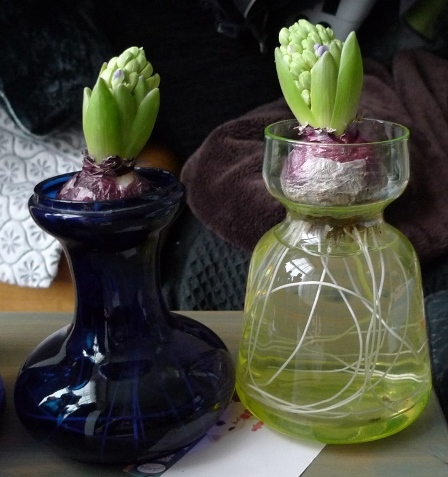 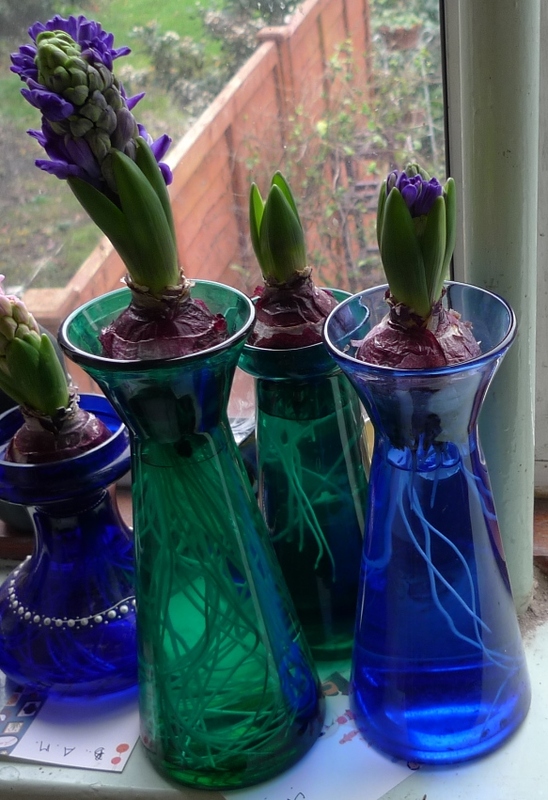 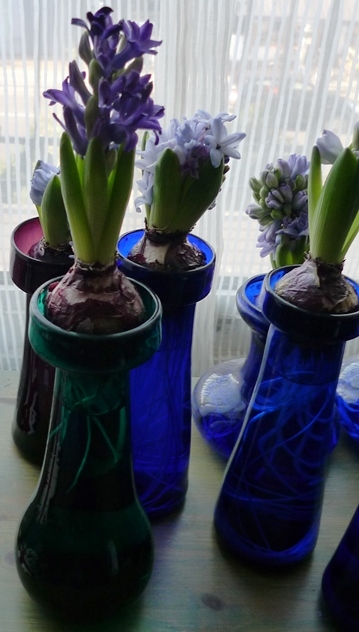 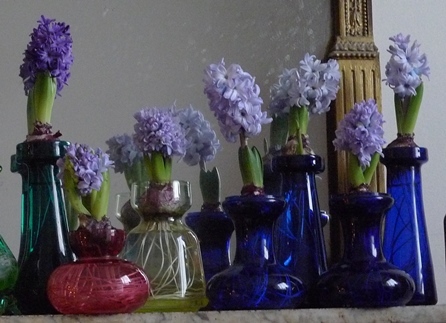 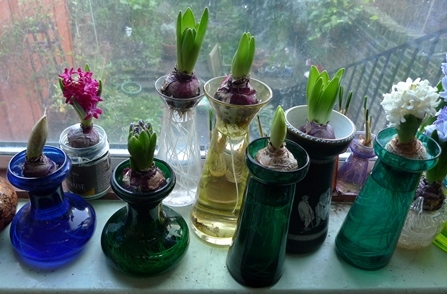 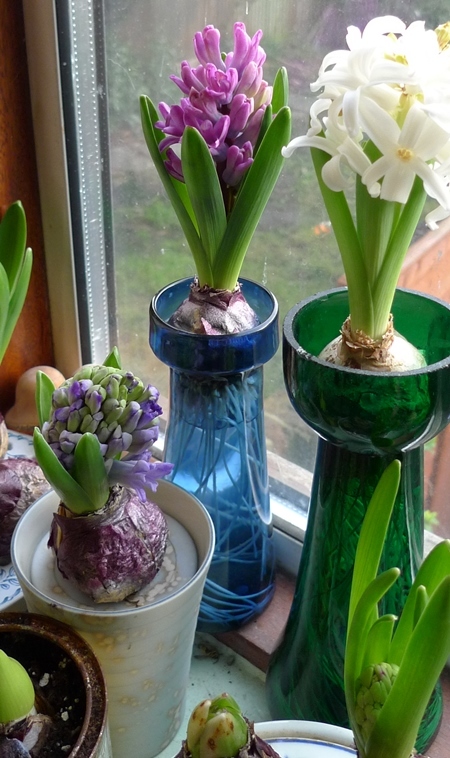 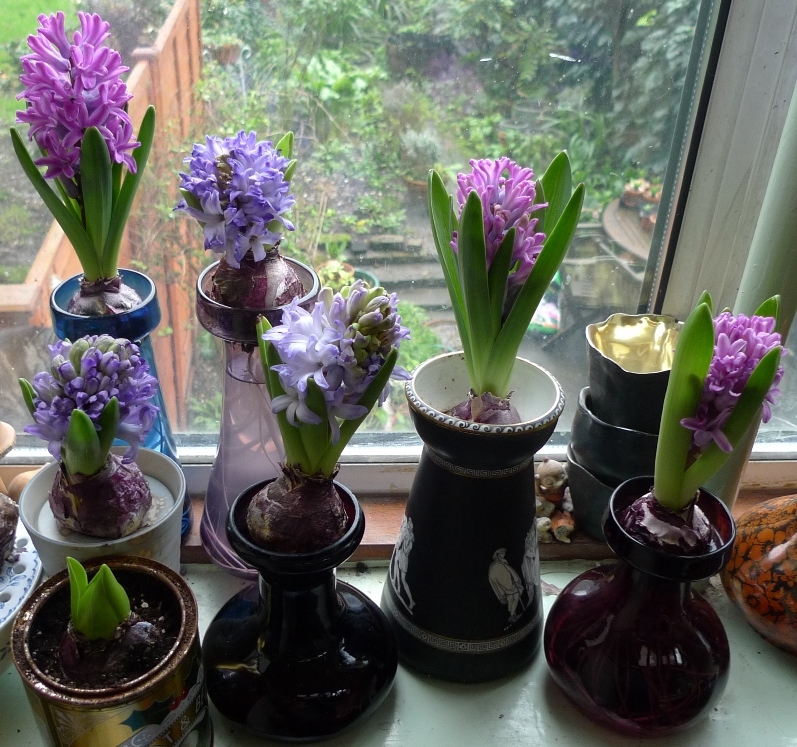 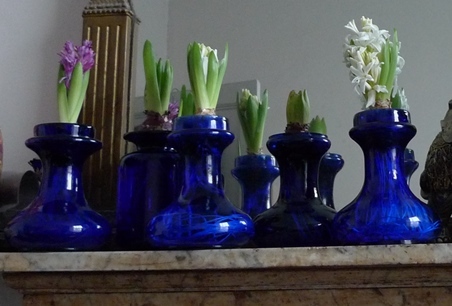 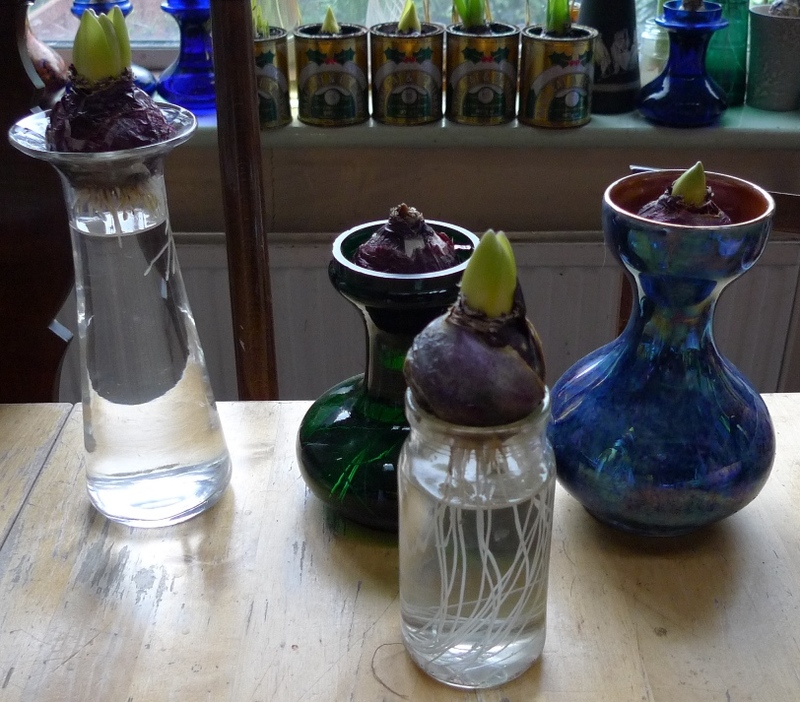 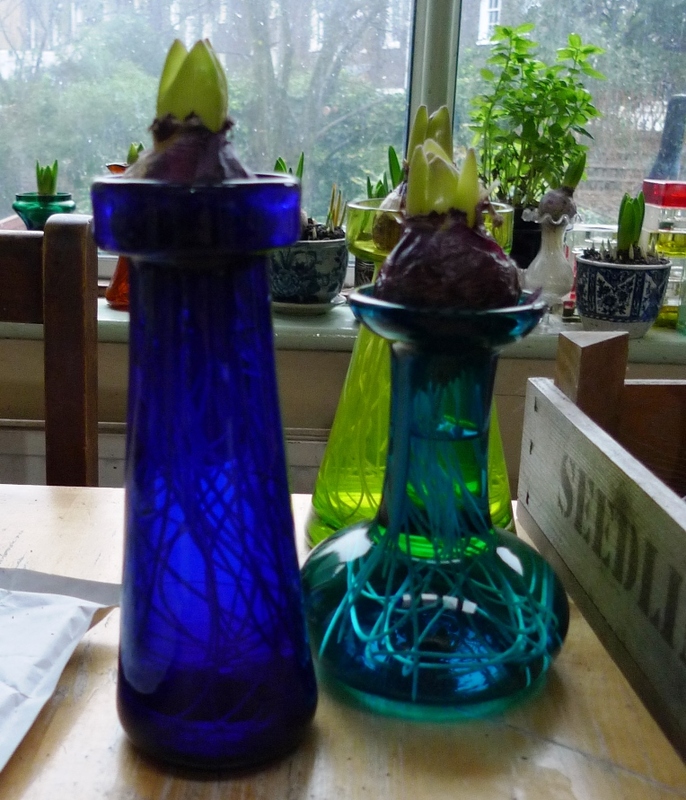 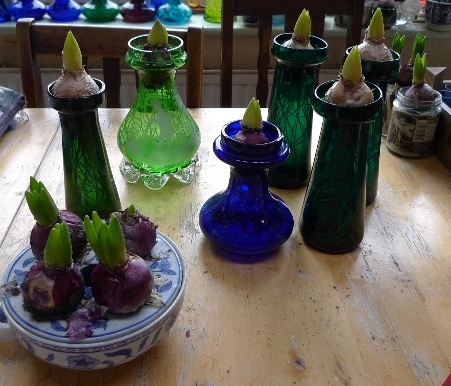 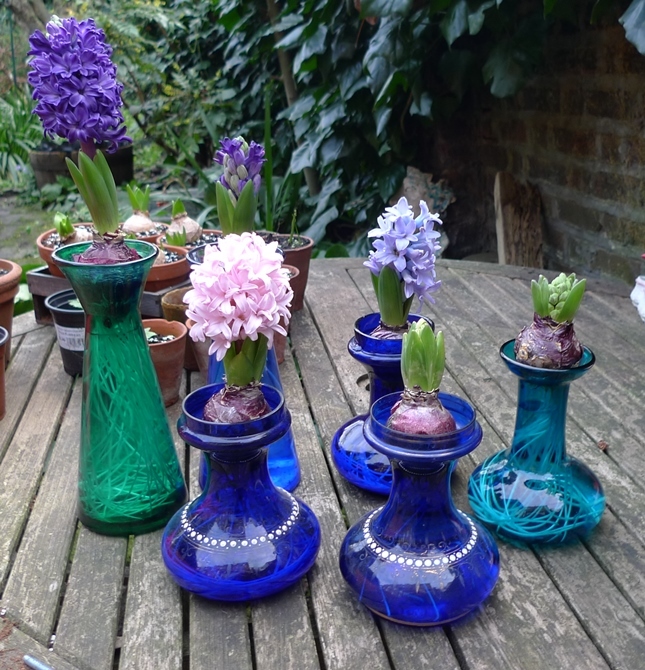 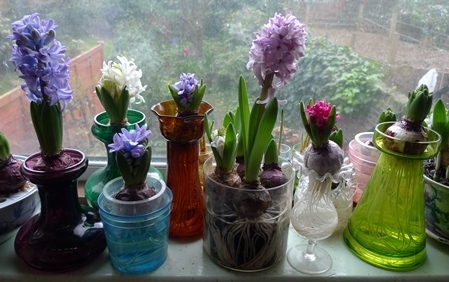 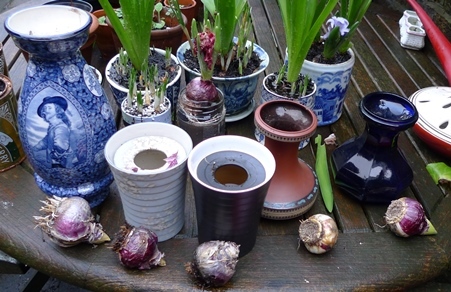 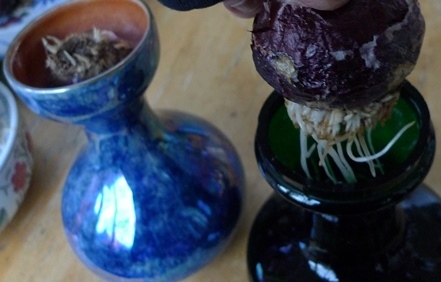 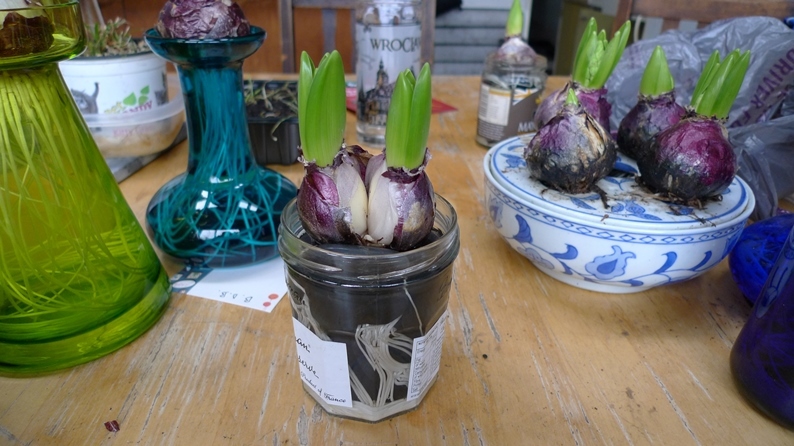 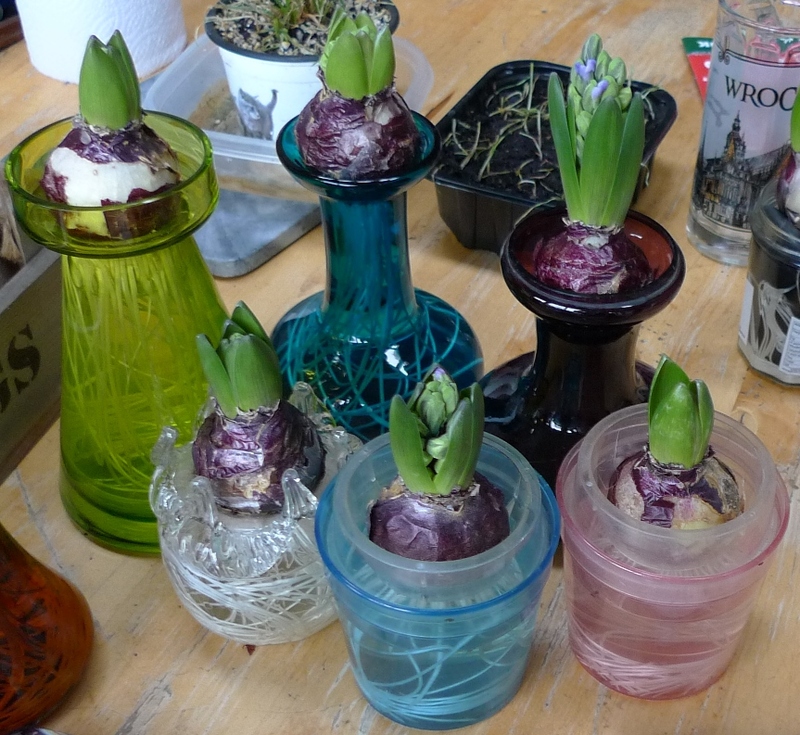 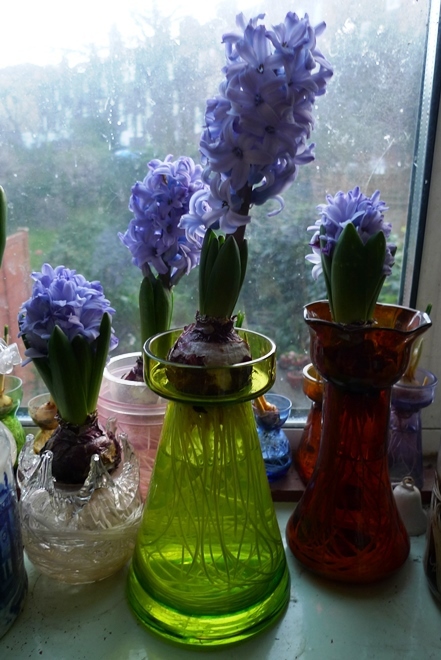 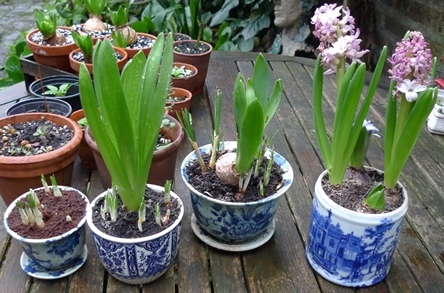 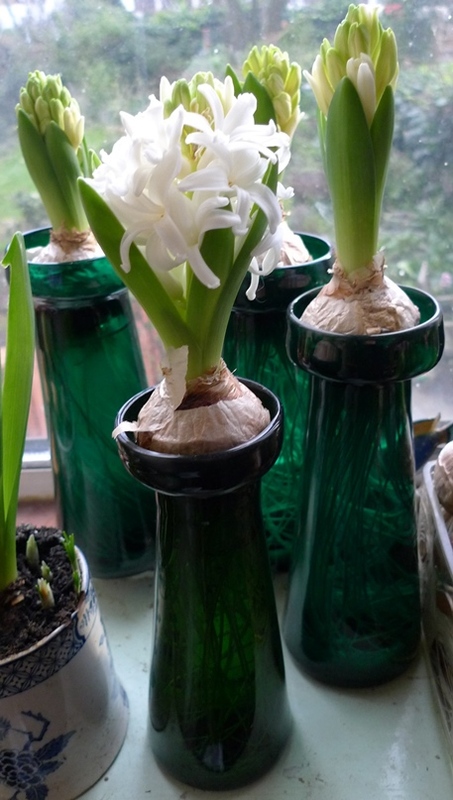 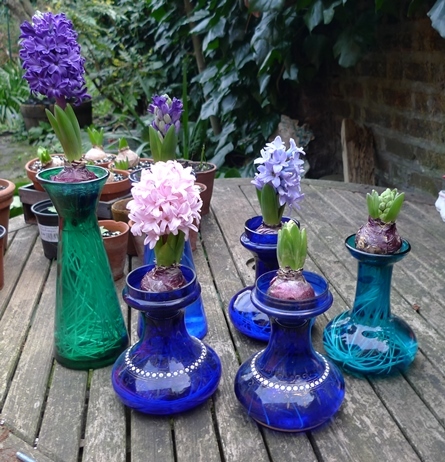 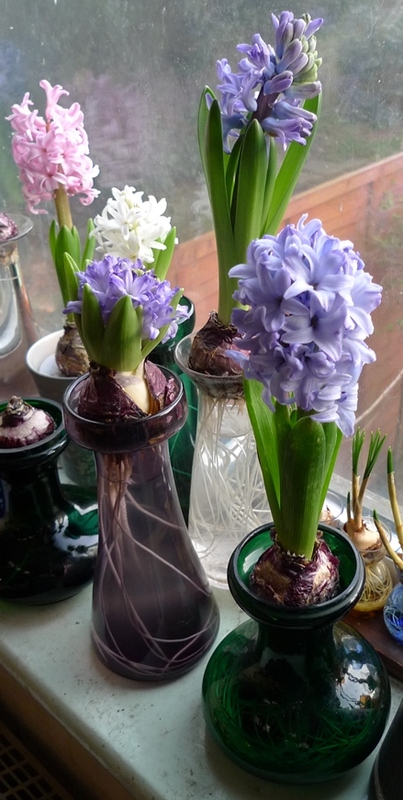 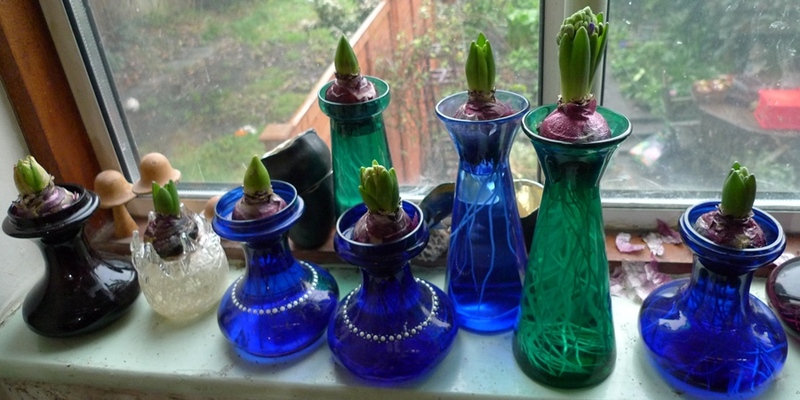 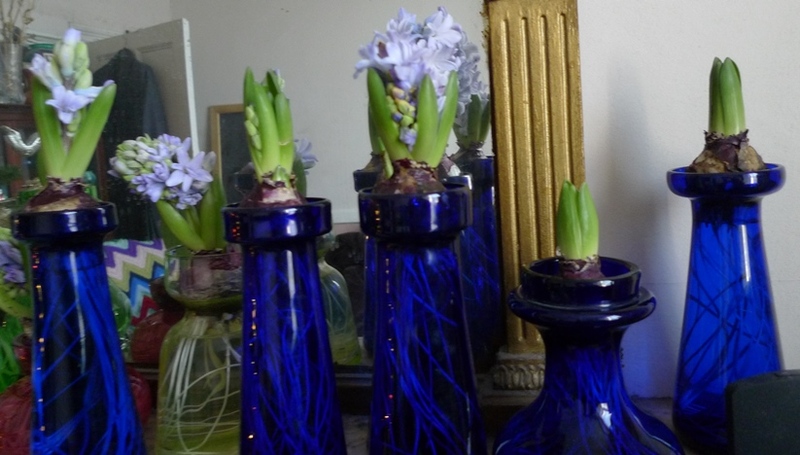 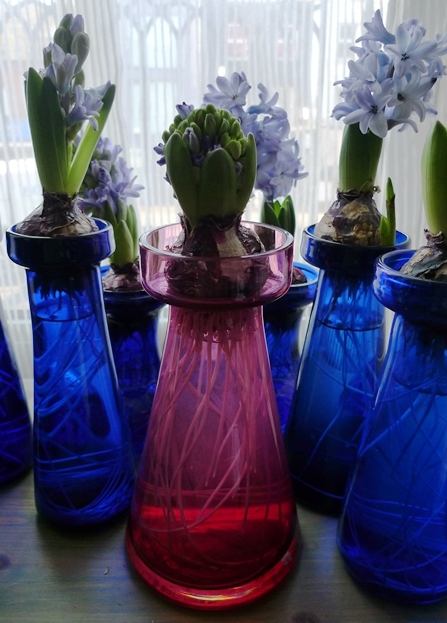 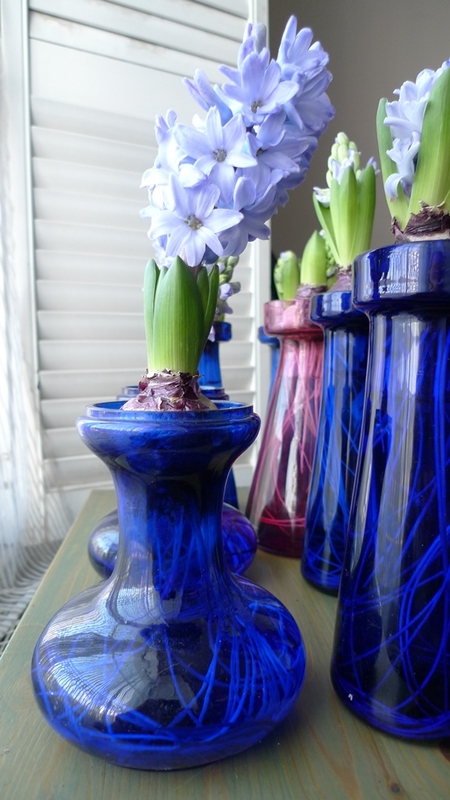 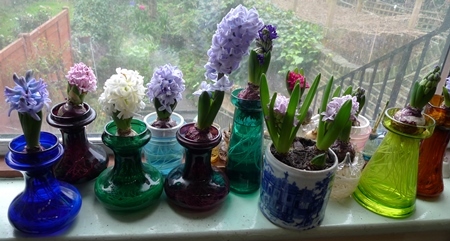 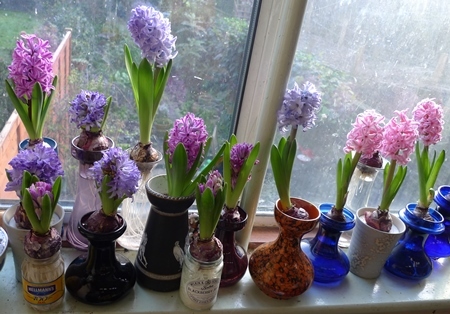 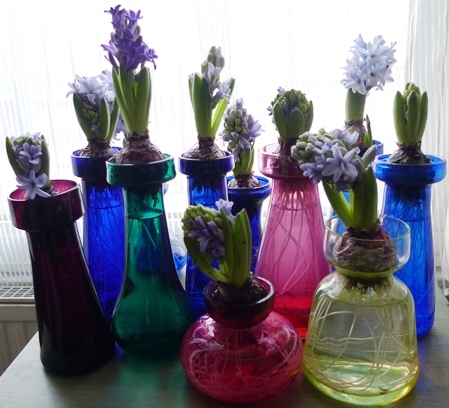 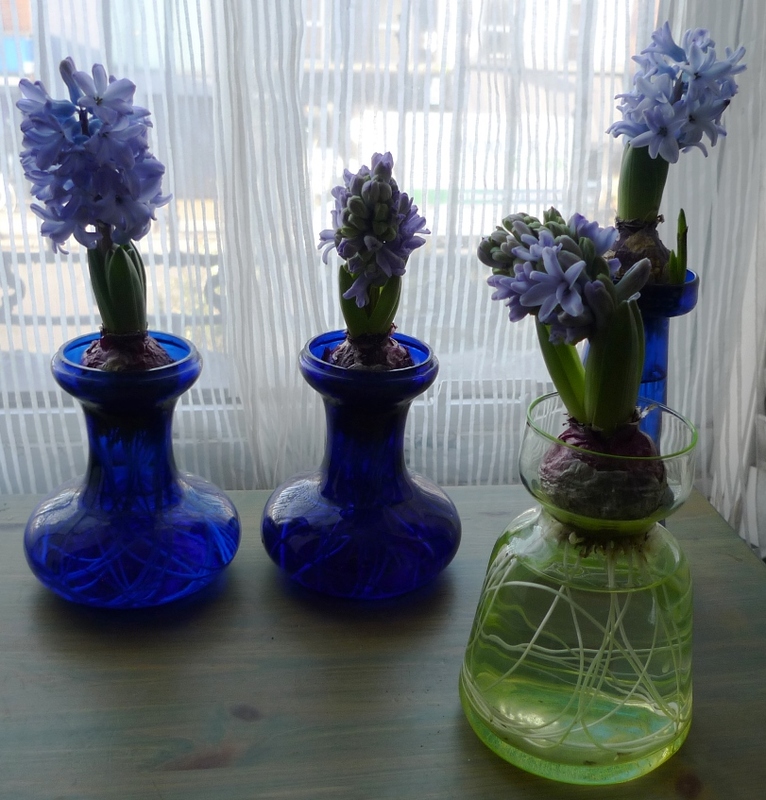 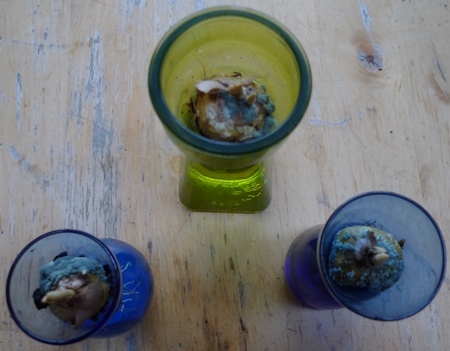 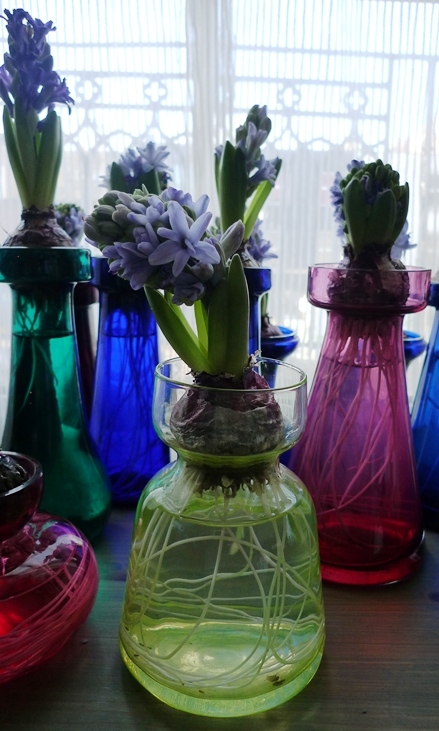 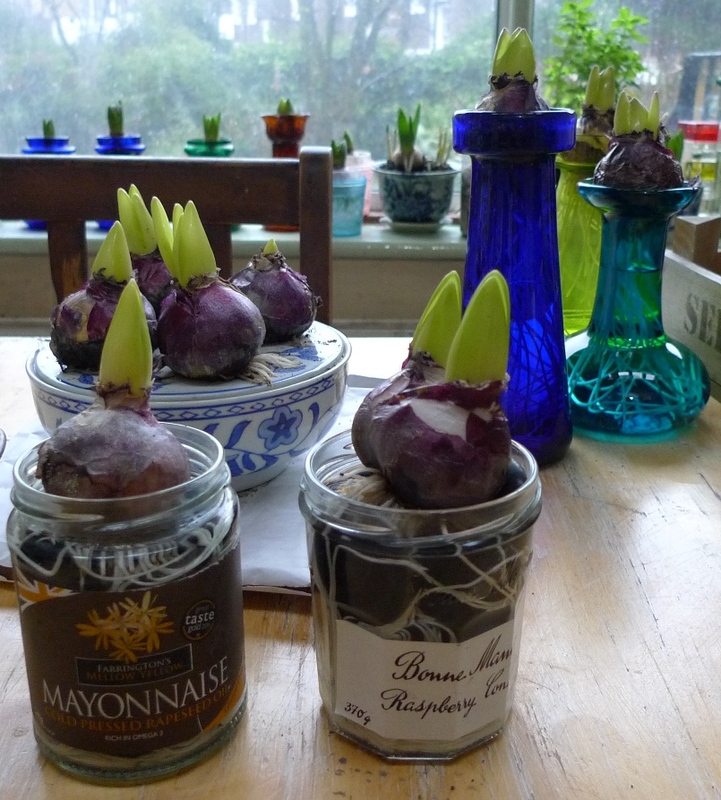 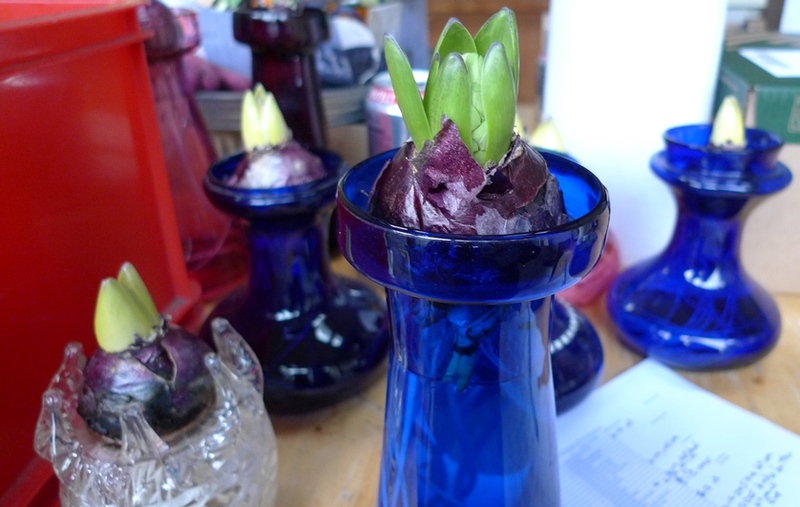 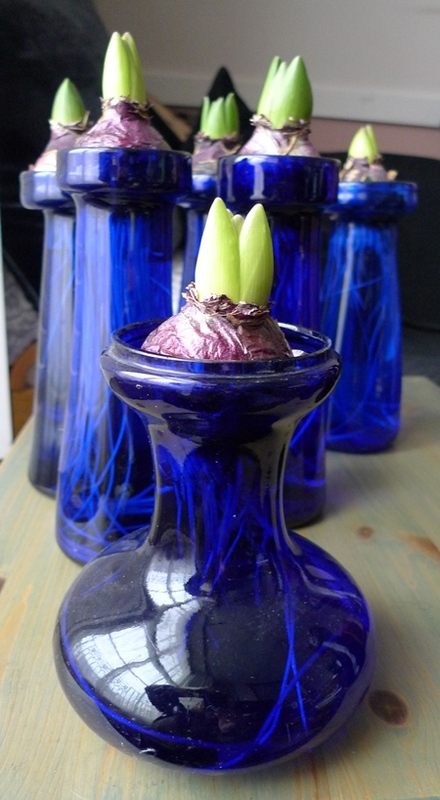 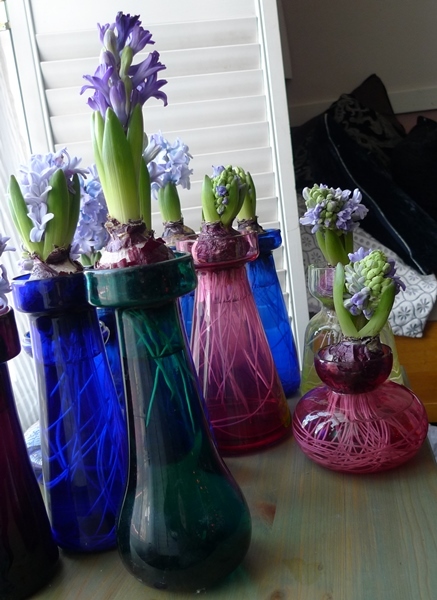 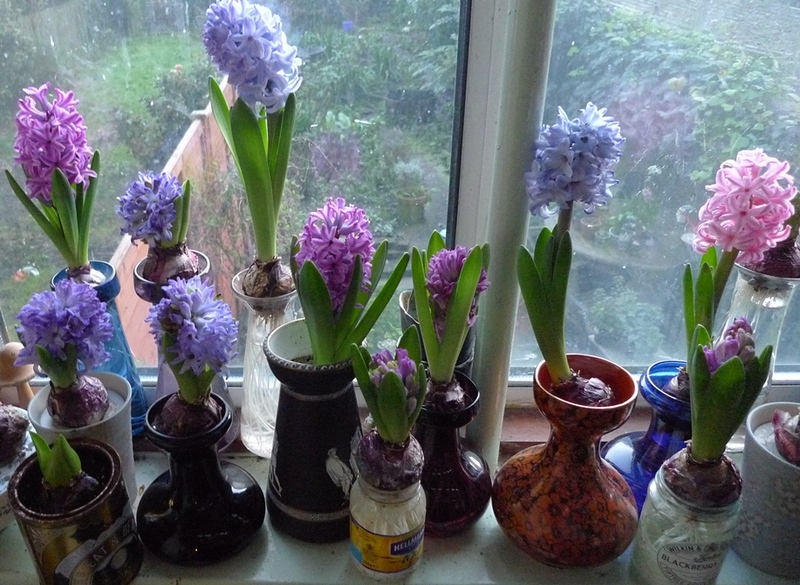 I try to carefully note which variety of hyacinth bulb I put in each vase but get a bit haphazard with the pots. 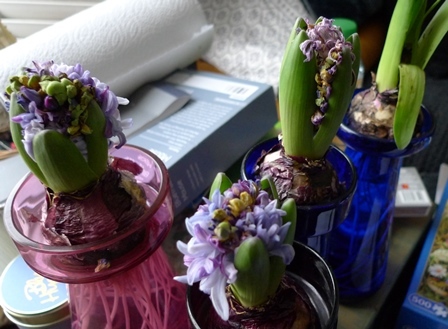 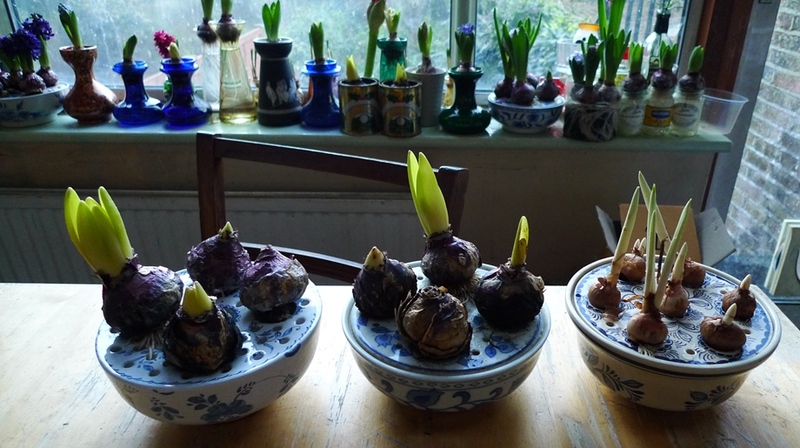 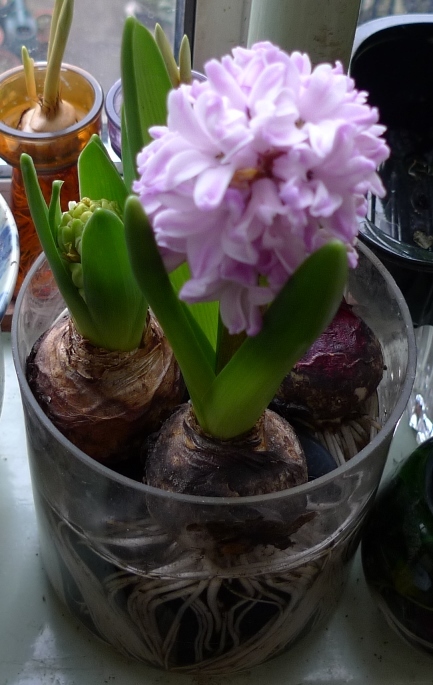 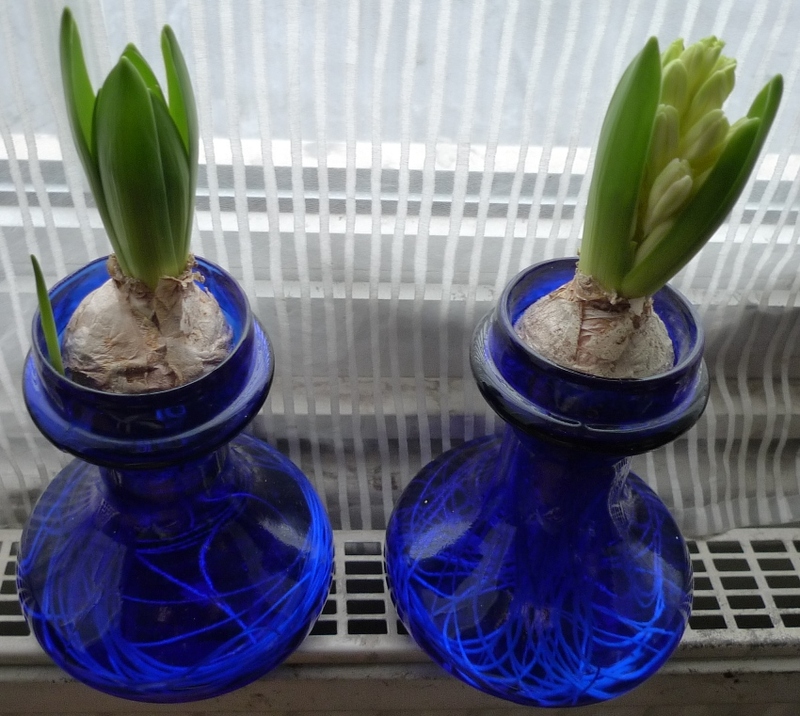 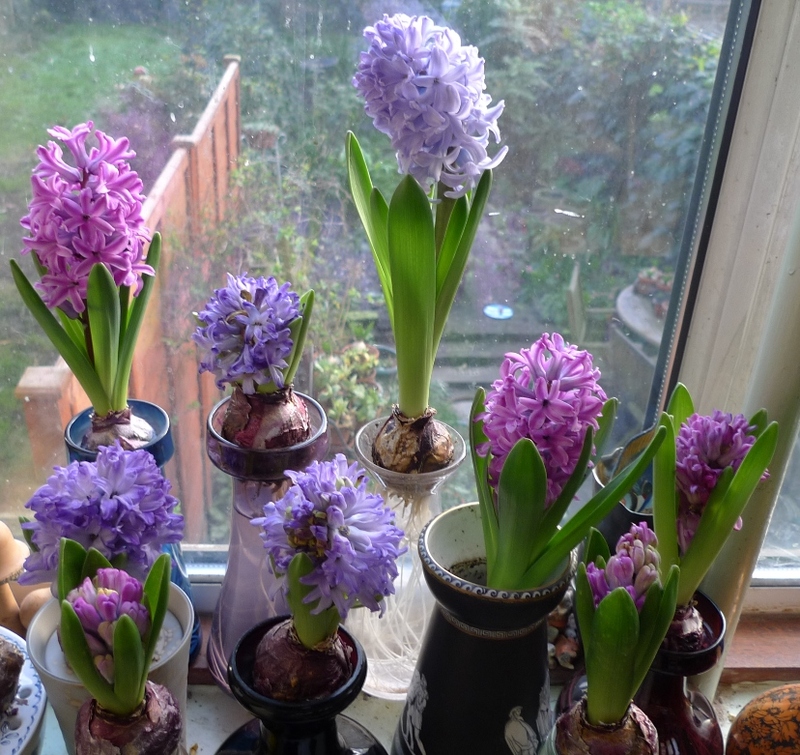 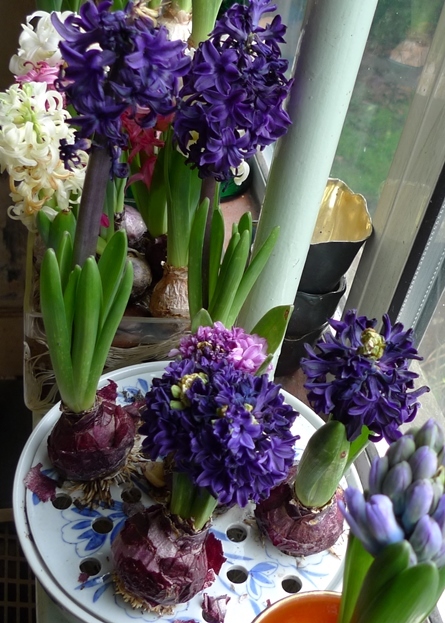 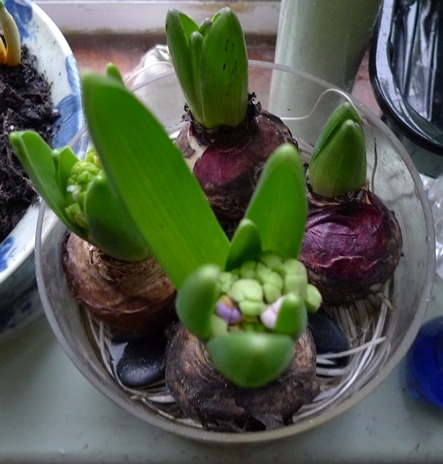 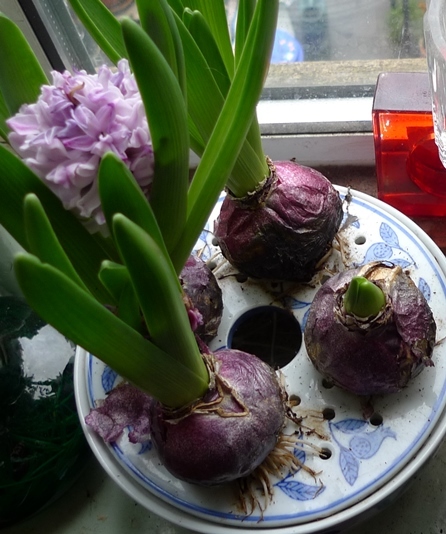 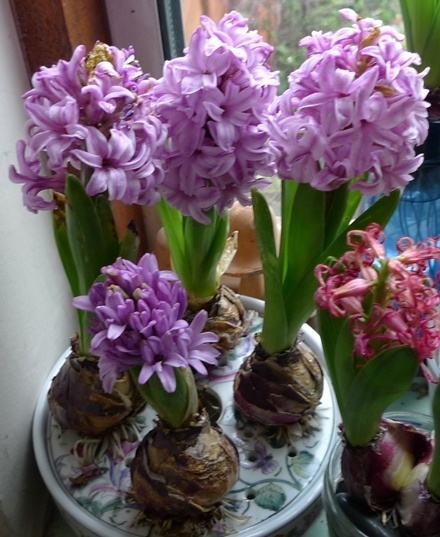 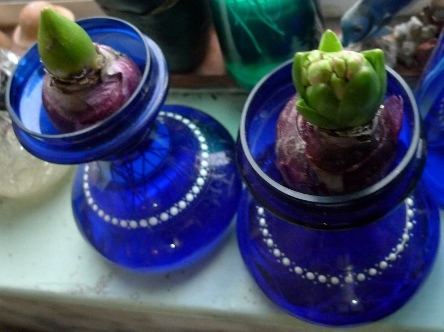 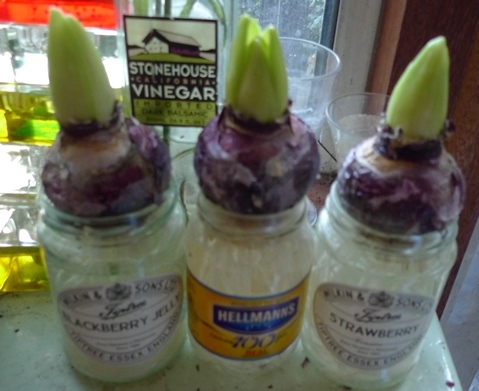 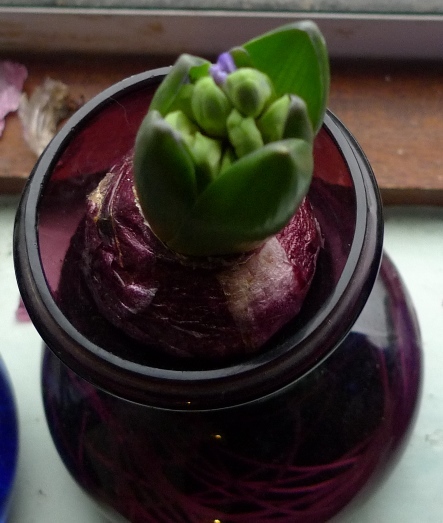 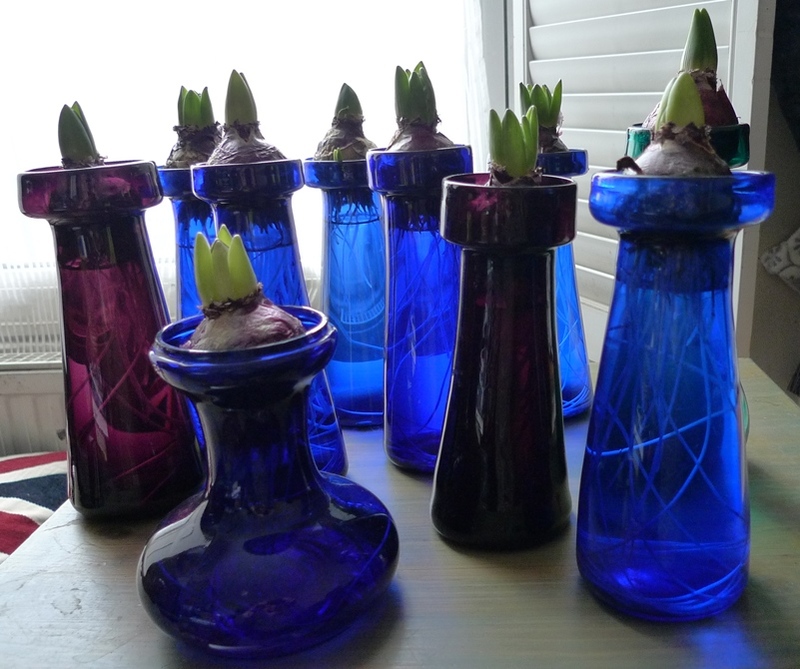 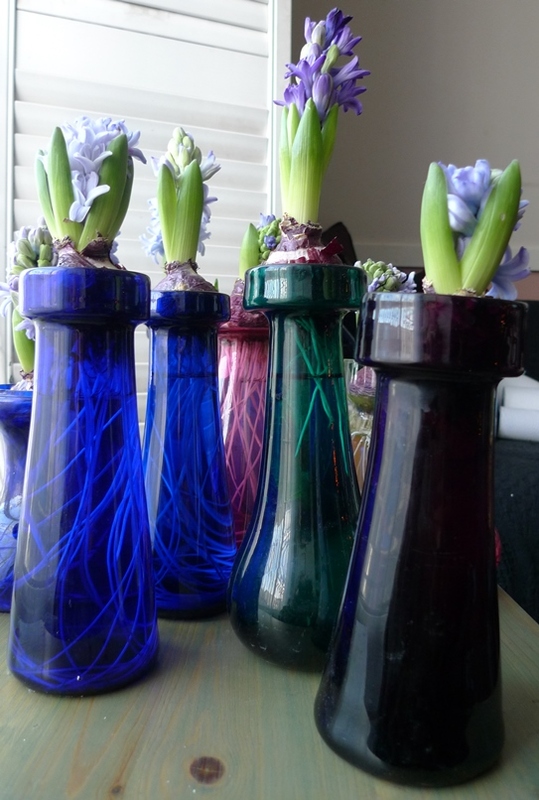 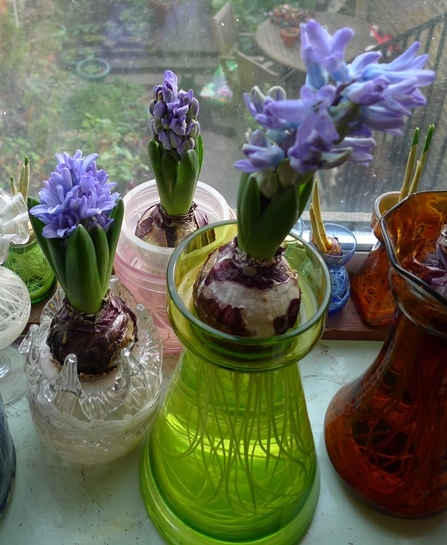 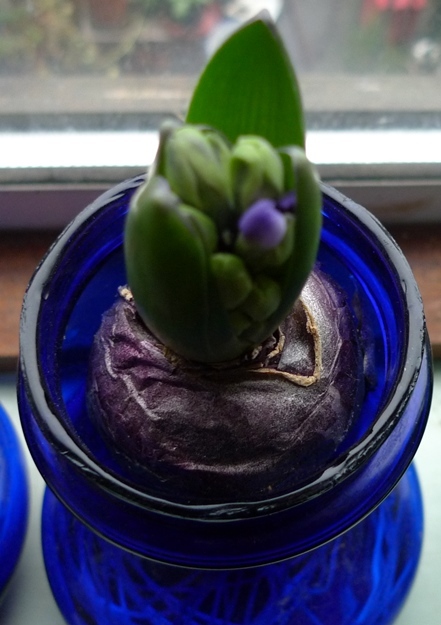 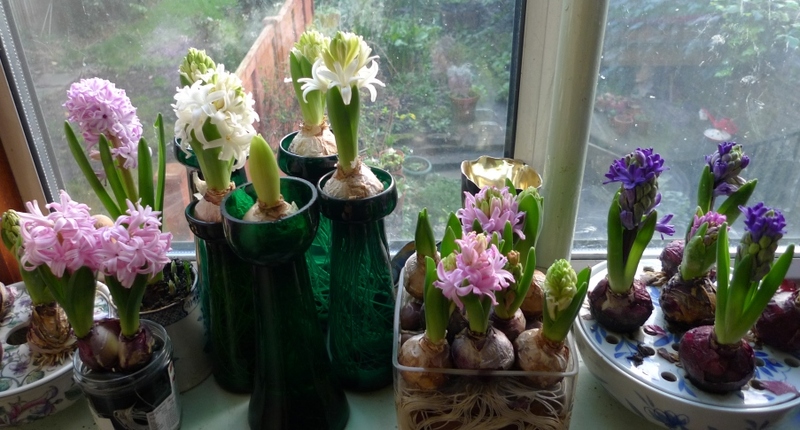 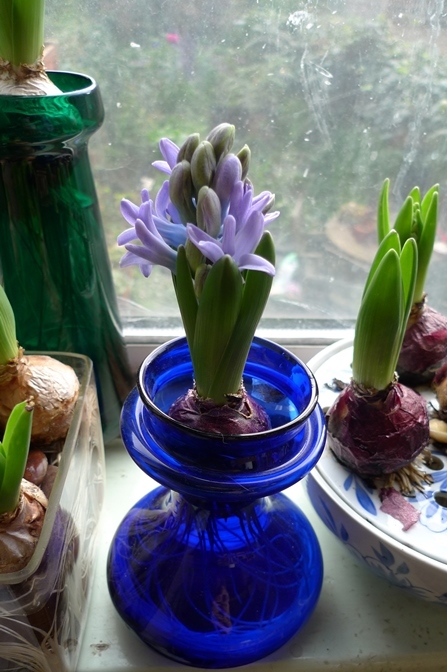 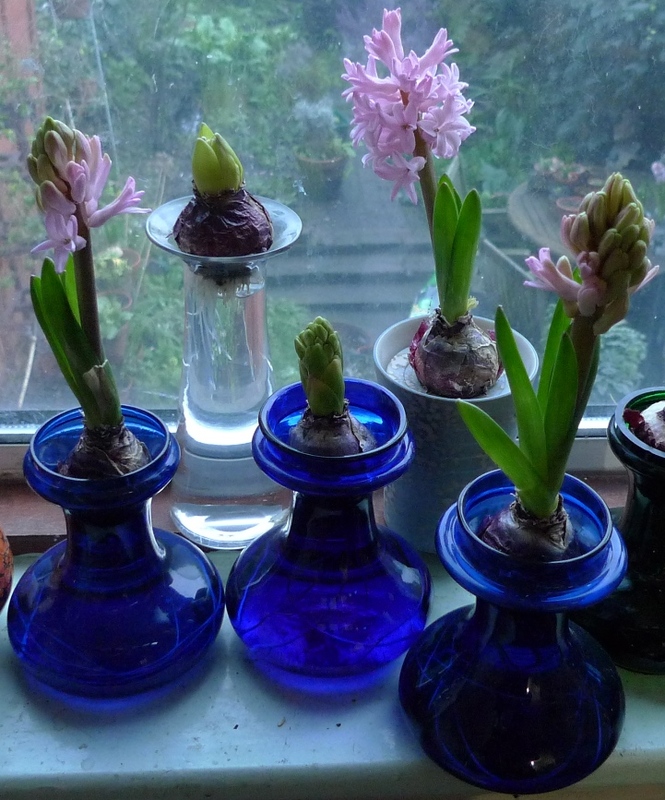 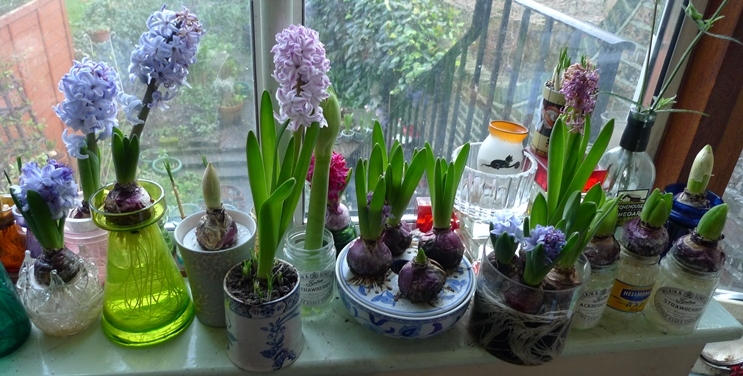 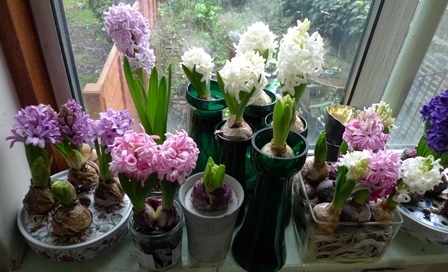 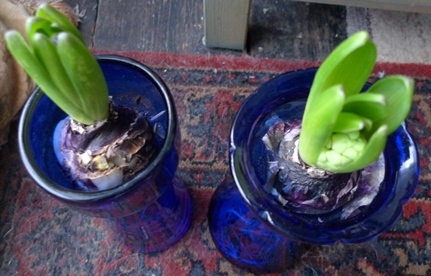 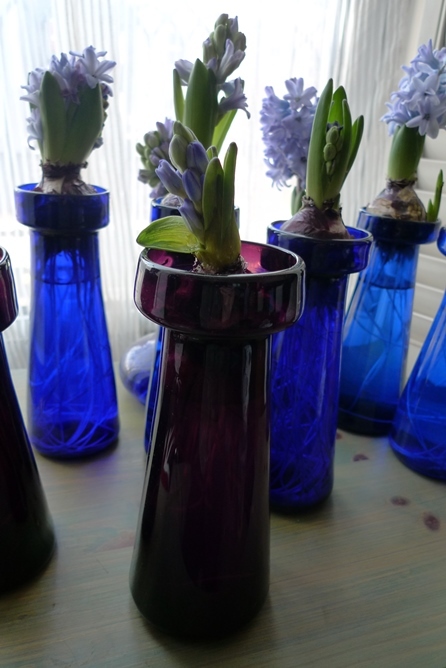 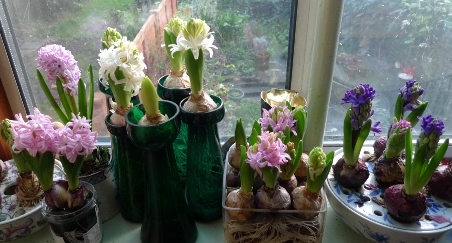 Christmas Day hyacinths are what bulb forcing is all about! 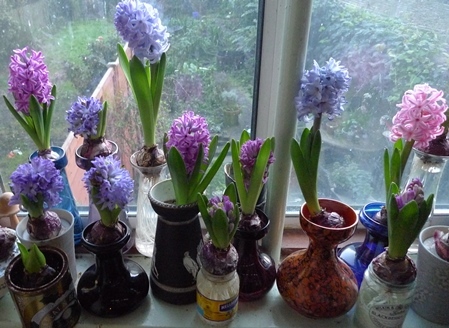 Some recommend staggered starting to have a succession of blooms. 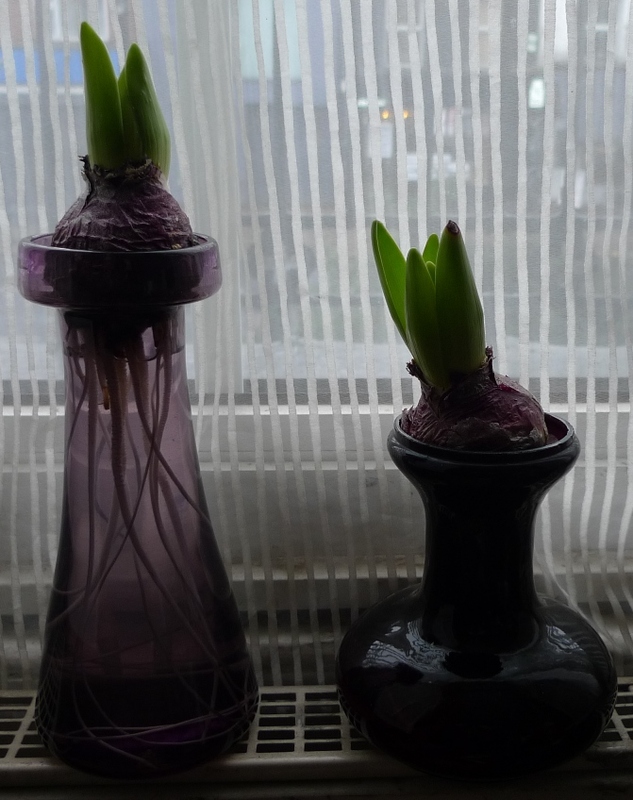 I can't do that. 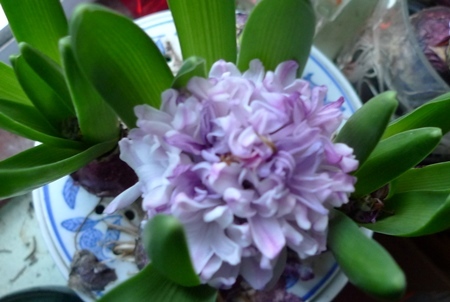 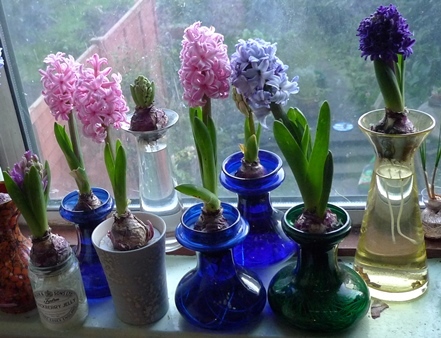 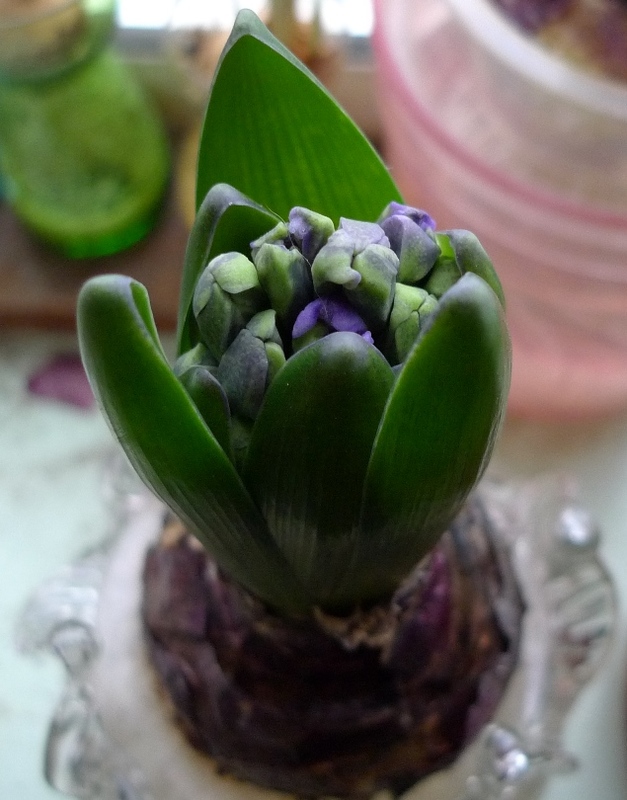 I want hyacinths in bloom for Christmas so start them all at the same time to have as many flowers as possible. 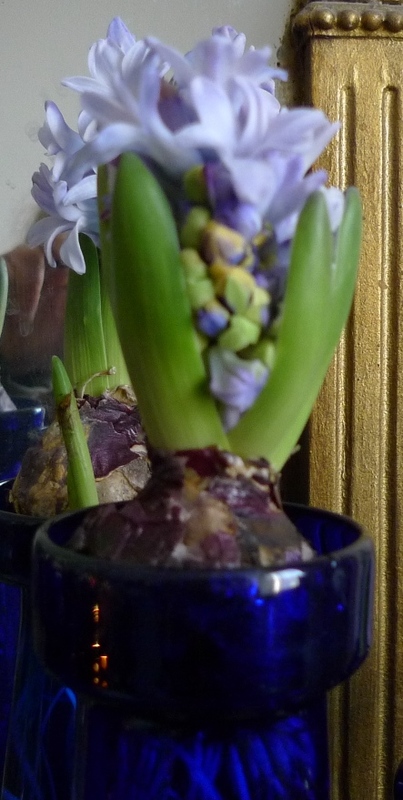 There are still bulbs in the cellar and some upstairs just in bud so I will still have a succesion of blooms. Downstairs on the kitchen windowsill. 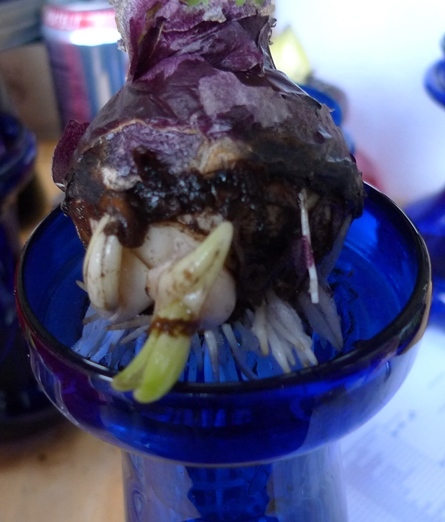 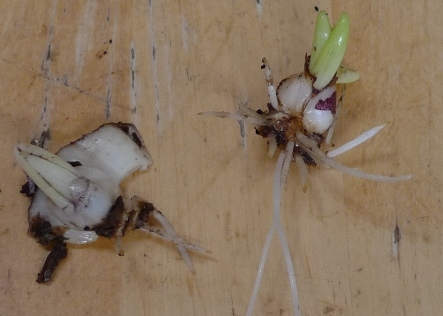 I carefully broke off the bulblets with their roots attached. 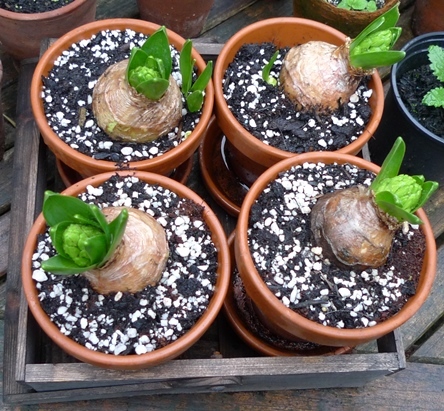 I planted them in a pot outside. Regardless of how careful I was, those long roots on the one on the right broke off but there were still those shorter ones so hope it will grow.